1. I will be conducting the experiment on 2 Nov 2013, at 8 am (GMT + 8) to 2 Dec 2013 at 8 am (GMT+8). 2. 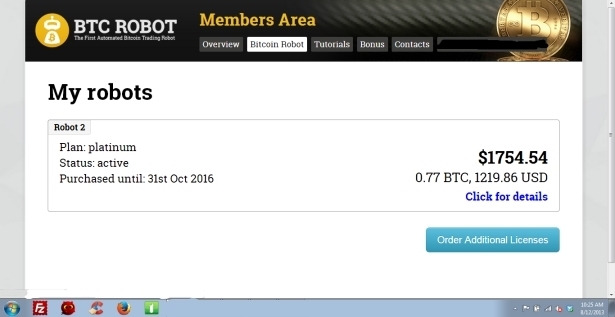 I will be converting the amount of money that I have in my btc-e account based on the current portfolio in my btc robot member’s area to bitcoins (at btc-e price) for easy calculation. 3. I will present my findings in a graph format on a weekly basis below and at the end of the month. 4. I will be using 0.6% transaction fee based on figures from Mt. Gox for the sale of bitcoins. Which methods do you think will yield the best results? 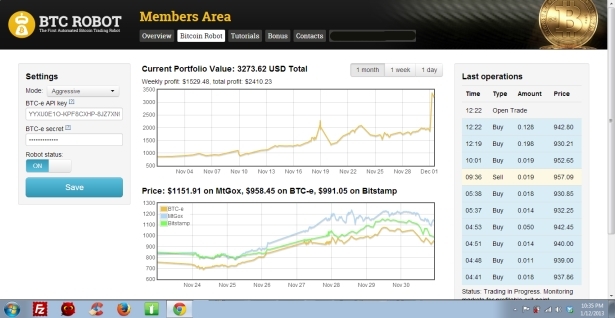 Here are the prices of bitcoins and my portfolio as at 8 am, 2 Nov 2013. Sorry for the delay in update because I was away for a business seminar over the weekend. Hello, you must understand that even if the robot may seem less effective than a simple price increase, as soon as prices stall and fluctuate (as they are certain to do), then you will lose much more than you would with our robot. You might get less profits with our robot than by riding on strong intermediate price rises but at least you will not blow your accounts or fall into 70% drawdowns with the robot if the prices were to go south. You are only look at one side of this trading story, not thinking about what will happen on the other hand. I hope this is clearer to you now. Note: I have topped up my account with 1.5899 BTC which equates to US$1553.42 as you can see below from my transaction history. Total Capital Investment in terms of BTC and US$. 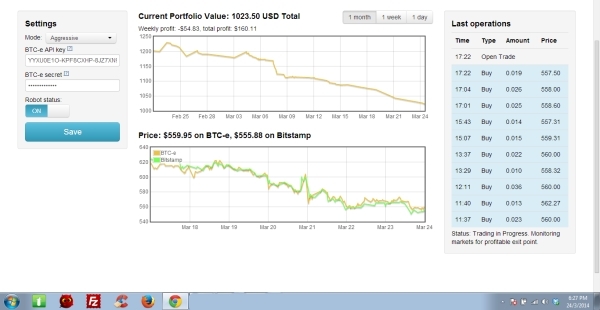 Note: I have withdrawn 0.01 BTC to demonstrate how to withdraw BTC from BTC-e for one of my videos. For this week, there was a lot of turbulence in the marketplace. Therefore, the amount of profits has seen a reduction in 3 out of the 4 scenarios. In fact, the once more profitable strategy of transferring bitcoins from btc-e to mt.gox for sale did not work out this week. Interestingly, the robot has transferred most of my bitcoins to USD which I believed is to prevent further loss of capital if the market dives even more. This clearly shows that the robot is able to minimize my capital loss. Hence, I can rest assure that if the price of bitcoin reduces to below US$200, I will get to keep more of my capital compared to the buy and hold strategy. Besides, if the price of bitcoin drops below US$100, I will be able to buy more bitcoins with my existing capital compared to when I bought them at a higher price. For this week, there is not much activity from the robot since there is not much volatility in the btc-e market compared to previous weeks. The robot is still having most of its holdings in USD to prevent any further loss in capital if the price of bitcoin happens to dive again. On the bright side, the price of bitcoin has recovered about 50% of its drop in value. However, there is no clear sign of the price going up for now. 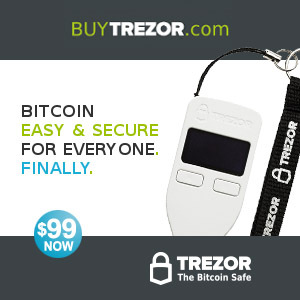 The once more lucrative method of selling bitcoins from btc-e to Mt. Gox is not that attractive as well. 3. Sale of bitcoins from BTC-e to Mt. 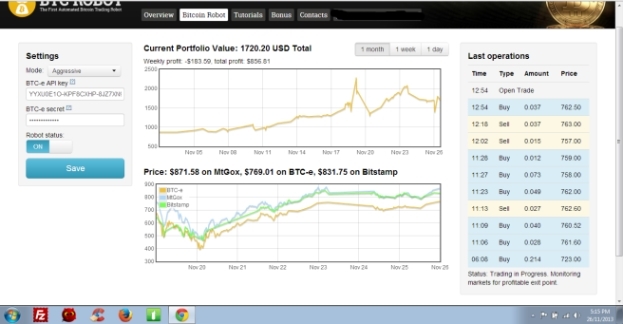 Gox – I have discontinued this since Mt. Gox has closed down. As of now, it is better for you to keep your money in cash and wait for the price of bitcoin to drop further before investing in them again. Please comment below and join the discussion. I would love to hear from you. Do you have a better performance with your robot? Feel free to share with me to make my study more accurate. Hi Jonathon. 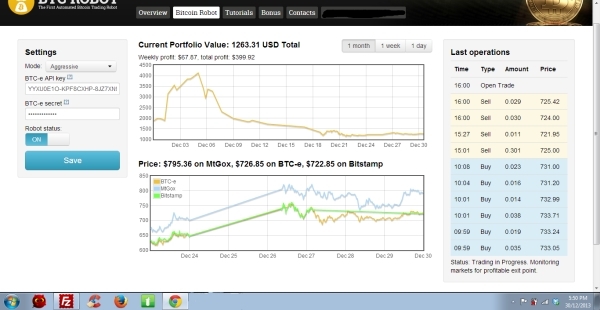 I am glad to see you are doing an analysis of the comparison of the robot to just ‘buy and hold’ bitcoins. My experience has been just like yours – I set up one account of 945usd on 24 August on Medium’ setting but it is only since I changed to Aggressive 2+ weeks ago that it is making a decent ‘profit’ – account now up 50%. 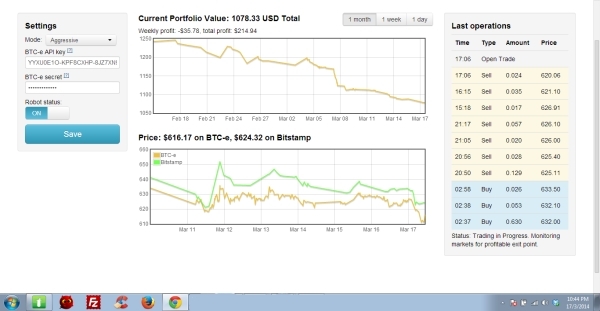 I set up a second robot on 15th Sept and have placed 2 bit coins in this on Aggressive setting – it’s ‘profit’ is shown now as 195usd but if I convert this into bitcoins at the current btc-e price this will only buy me 1.9 bitcoins – so whilst it appears to profit, the robot has actually lost me the equivalent of 0.1 bitcoins over ‘buy and hold’. I am coming to the conclusion that much of the published details of robot profit are just due to bitcoin price rise ! In order to assess the option of buying bitcoins on BTC-e and selling on Mt Gox you will need to be very careful in ensuring you fully take into account fees charged – at both ends. the trades listed in the table in the right-hand box were the ‘most recent executed trades’ – not ‘open orders’ (not yet filled) – or am I missing something? Thanks for pointing that out. I have verified with the support team and they told me that the robot has only one open trade at any time. The table shows the recent trades. I’ve heard that the BTC robot is only focusing on increasing your USD, not the amount of BTC. Im looking forward to see the result. How is it going so far Jonathan? As of now, I have doubled my investment for this month. With the BTCRobot or with your other strategies? Ive just bought the robot -from your referal so youll get som extra pocketmonney 🙂 – and im just waiting for my salary to se what the robot can do for me. How much do you think i should start with? 500USD 1000USD? Did you buy from me? I don’t see your name in the list of buyers. My comments from the Robot Development Team were the same. There are clearly a lot of people asking the same questions so your case study is going to be very useful – though you may need to keep it going for quite some time. I will be running this experiment for many months in order to get a more accurate picture since the robot is still pretty new. I will be adding my sister’s account into the experiment soon so that I can see whether the percentage of profit you make is affected by the amount of money that you begin with initially. My sister started with a few thousand dollars and I started out with a couple of hundred. Hence it will be a good comparison to see whether your initial deposit matters. I received same comment from the robot team. However, I switched off my robot. Buy and hold is outperforming the robot by far! Obviously some people are happy to see a dollar profit and are not questioning the robots performance. Thanks Johnathan for your excellent work. I’m slightly inclined to switch off my robot and ‘buy and hold’ for the same reason. It will be extremely interesting tho’ to see if the robot does manage drawdowns better than buy and hold – as this is clearly one of the considerations for the long term – and is stated as a major advantage by the bitcoin team. So far with just the minor drawdowns we’ve seen it doesn’t particularly seem to have managed these particularly well! Another thing you can do is put some bitcoins or usd into a separate account in BTC-e; convert all to usd and then use MT4 to trade BTCUSD – its not spread betting so there is no gearing; you just trade on the increase/decrease in price using stop losses and take profit – so far I’ve put in 0.5 btc and converted this to 375 approx usd (about 4 days ago) and am now up 50 usd – clearly the trick is to sell as soon as things go into a ‘downtrend’ and buy back when at the ‘bottom’ (but the problem is knowing when either state exists – tho’ I’m disappointed the robot doesn;t seem to be spectacular at this either!) – i.e. you are trying to become a ‘human robot’ and outperform btc robot! My objective for using a robot to trade is to free up some time for other more important matters like spending time with family or building other businesses. I wouldn’t want to sit in front of the computer all my life to monitor trades. You can certainly make more money if you are in front of the computer with the necessary skills every day. For myself, I wouldn’t want to spend so much time making money and neglecting other important aspects of my life like health for example. I’ve given serious thought this evening to BTC Robot. It has doubled each of my accounts since August/September. 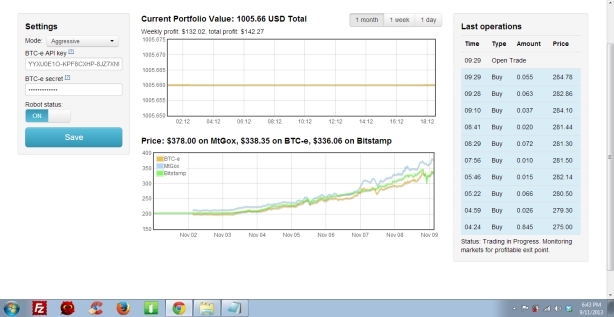 But in each case the Robot has lost half of my bitcoins over this time e.g. 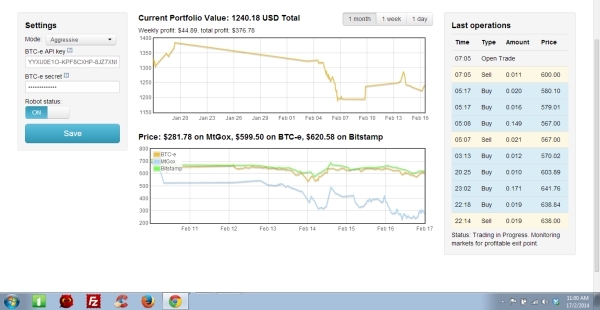 My smaller account started on Oct 24 2013 with 2 bitcoins which I put into it – it has more than doubled in value by today (27 Nov 2013) but the account funds could only buy 0.91 bitcoins – so the Robot has lost me 1.09 bitcoins in 2 months which is about $900 dollars – a 54% drawdown! I’ve therefore taken the plunge and switched off both my BTC Robots and converted all my funds on BTC-e into bitcoins. Thanks Patrick for prompting me to take action! Thanks for sharing your insights. What I have observed by reading the profit and BTC price graphs is that the robot will cushion you against the nose dive in prices when it happens and retain most of your profits. This is important for people who just entered the market since they may not know whether the price of bitcoins will continue to increase or take a nosedive when they enter the marketplace. The robot has lost me $3500 over buy and hold since Sept which is why I have turned off both my robots. Not sure of reasons why robot performs so poorly – 1) I notice it very frequently sells at price X then soon after buys back at price Y which is HIGHER (which will definitely loose you btc!!) also 2) on any setting you pay BTC-e for each transaction (even more on ‘Medium’ setting as this trades very frequently) – I think it is very likely that the BTC Robot Team get a cut off this transaction cost (which is why they are keen for you to do many buy/sell transactions) – and this also reduces your profit – maybe worth checking this out, Jonathan. RE; Wizebit. I have a number of concerns about Wizebit 1) Having sent them 2 emails a few days ago, they have never had the courtesy to reply 2) A number of links on their web site don’t work 3) if you click on the Plus500 link its brings up the message ‘referral is from an unathorised promotion and you cannot continue to Plus500’ 4) the bitcoin price chart only goes up to September!!! Gives me considerable grounds to feel this is not a reputable company – but you may know different. I agree with you. I haven’t got any reply from them for very long. Hence, I would not recommend this service for now. Great case study. I was interested in learning your process for Number 3 scenario. How were you able to buy from BTC-e and Sell to Mt. Gox? -is there the option to trade between different exchanges while using the same trading platform? if so, which do you use? Do note that scenario 3 is hypothetical. I have not done scenario 3 personally. It is based on a suggestion from one of my friends to add this scenario into this case study. With the 50% drop in btc price, now will be an excellent time for your Case Study to be able assess how well the robot copes with a significant drop in price and then (hopefully) a significant recovery – i.e. How well it locks in your profit on the downturn then takes the opportunity to purchase more BTCe cheap for the recovery! I’m already convinced buy and hold is supremely better so my robot is switched off currently! Great stuff Jonathan. The clear conclusion coming out to me is – do not use the robot or you will lose bitcoins – just buy bitcoins and ‘buy and hold’. If you want to sell then transfer and sell through Mt Gox as that will give you the best price. QED. Selling to Mt Gox will need a precise timing because it is not profitable to do so now. in the summer – not sure if it is still a problem. Looks like over the last weeks the robot has lost you quite a lot of bitcoin – whereas you’d have thought it might have been good ( as the marketing blurb says) at safeguarding’ you in the downturn. As said by others elsewhere on your website, I think the only correct way to assess the success of bitcoin robot is how much bitcoin profit has it made for you – if it is only making usd profit that is incorrect and only a measure of the price increase in bitcoin! If it can’t make any bitcoin profit (and over 3 months it never did for me) then the robot algorithm is very poorly constructed. Peter, that is the truth! I bought the gold membership yesterday, and if i’ll detect any big losses of btc, witch i hope not, then i have to cancel the membership and hopefully will get my money back! It is not all about the Dollars, it’s all about the btcs!!! Jonathan, what do you think about this? Did you deposit USD or BTC into your BTC-e account? During stable climb the robot sells at a lower price than it buys bitcoins…that is not in my interest! Totally agree with you! I have predominantly noticed that the robot generally sells at a lower price and buys at a higher price – which is why I started with 9 BTC and after 3 months had 4 BTC’s value in my account (which in USD terms was well into profit!). That is why I closed out my 2 robots and am now ‘buying and ‘holding’ my remaining BTCs! I think the BTC Robot team get paid a transaction fee for every transaction made at BTC-e so they are probably doing quite nicely – especially if you use the ‘Moderate’ setting which generates lots of transactions every day (whereas ‘Aggressive’ is lower transactions – but you will get a much better return (i.e. not so much of a BTC loss!!) if you use this setting). The main benefit for me of the BTC Robot is, even though it is ‘wasted money’ it has got me into Bitcoins! Saying that the BTC robot team is getting paid for each transaction is too much. You shouldn’t say things that you don’t have facts to backup. I didn’t say ‘the team is getting paid’ only that ‘I think the BTC Team gets paid …..’! But either way it should be easy to verify which is correct – suggest as owner of this web site you contact them directly and ask them the question! Update – the BTC Robot Team have stated to me categorically that they do not take a fee for each transaction on BTC-e.
Can you please explain the buy and hold option in your case study? On Nov 2nd you started with 4.388 BTC, on 27th Jan you have 5.9669 BTC. Buy and hold means to me you allways have the same amount of BTC. 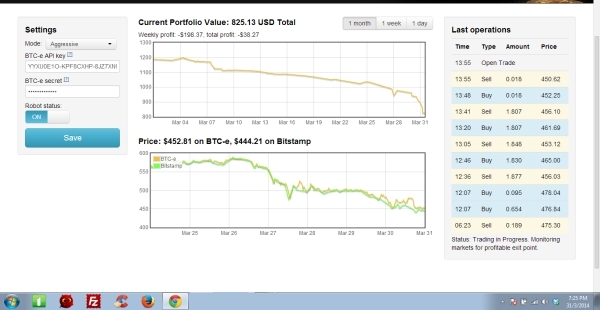 Whats the answer for the accumulated BTC’s in you buy and hold case study? I topped up my account in December with some bitcoins. That is why there is an increase in the amount. Just wondering after your study has been going for such a long period of time if you are able to state your conclusions – in particular is Buy and Hold better than Btcrobot? – and does Btcrobot make a profit (in btc not usd – which clearly just measures price increase). I’m sure now you must be in a position to bring your study to a clear conclusion in terms of advice to all future potential btcrobot purchasers I.e. 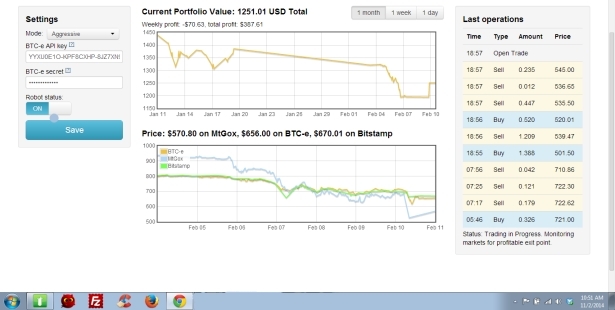 Should they purchase the robot or just buy and hold btc! What is your conclusion? Robot or Buy & Hold?